Don’t get caught with grey hair or roots between color appointments. Our two minute color touch up, with ten different shades, is a fast and commitment-free way to erase roots and blend away grays. Specially designed to give you a temporary solution between colorings, it washes out with one shampoo . 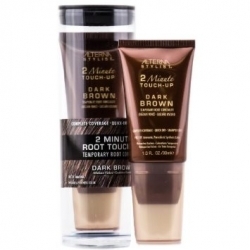 This mineral rich formula dries quickly and won’t flake or rub off once its dry. Stop by with any of our Pistachio team members for a free consultation.